CLASSIC. This 60-minute adaptation of Oscar Wilde’s uproarious play is easy to stage and perfect for young actors. Jack has fallen in love with Gwendolen, the cousin of his best friend, Algernon. Meanwhile, Algernon has plans to woo Cecily, Jack’s young ward. The only problem is that both women will only love a man named “Ernest.” To win Cecily’s hand in marriage, Algernon poses as Jack’s brother, Ernest. But when Algernon arrives at Jack’s estate, he discovers to his dismay that Ernest has recently “died.” In the meantime, Jack has made plans to be christened with the name “Ernest” at 5:30 p.m. not knowing Algernon has also made arrangements to be christened “Ernest” the same day. 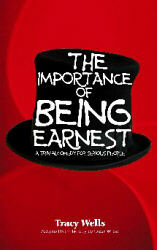 In the end, Algernon and Jack realize the importance of being earnest!